Now living in California with Barbara and Cedar! “Violet’s Four Leaf Clover” turned one year old in January. She is the most affectionate lab I’ve ever had. She loves attention, no matter where it comes from. She is a real character and is an amazing Frisbee dog. She beats Cedar to the disk every time. 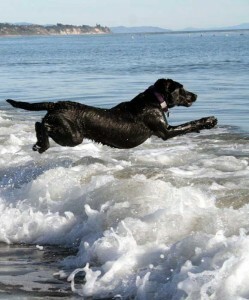 She has learned many new things since coming to California and had her first agility puppy class in October. She’s been learning Rally Obedience as we work on improving her ability to focus and will be getting a little more serious about agility training now that she’s a year old. She and Cedar could not be better friends. They love to share everything and playing Frisbee in the park is their favorite playtime activity.